Ok, last comic about the dog for a while. I had to eventually admit to myself that this one just isn’t going to get colored and put it up as-is. Sorry about that. I am too busy. It is getting to be that time of the semester. So yes, big announcement I had to make: I’ve been accepted to the Languages and Cultures of Asia MA program. I’ll be studying Thai (language, literature, history, special interest in translation). Officially this is a terminal MA program with some expectation that one will continue on to the Ph. D. I have not yet determined whether I will apply for that option or not. The stomach troubles associated with this comic’s creation are long past, but the effects linger on. After 24 hours or so of getting food from the fridge instead of the bin in the mud room, Maya came to believe that when the fridge door opens, it means MAYA FOOD comes out. Oops. Us having to give her pills with peanut butter (our PB is kept in the fridge) didn’t help this impression. 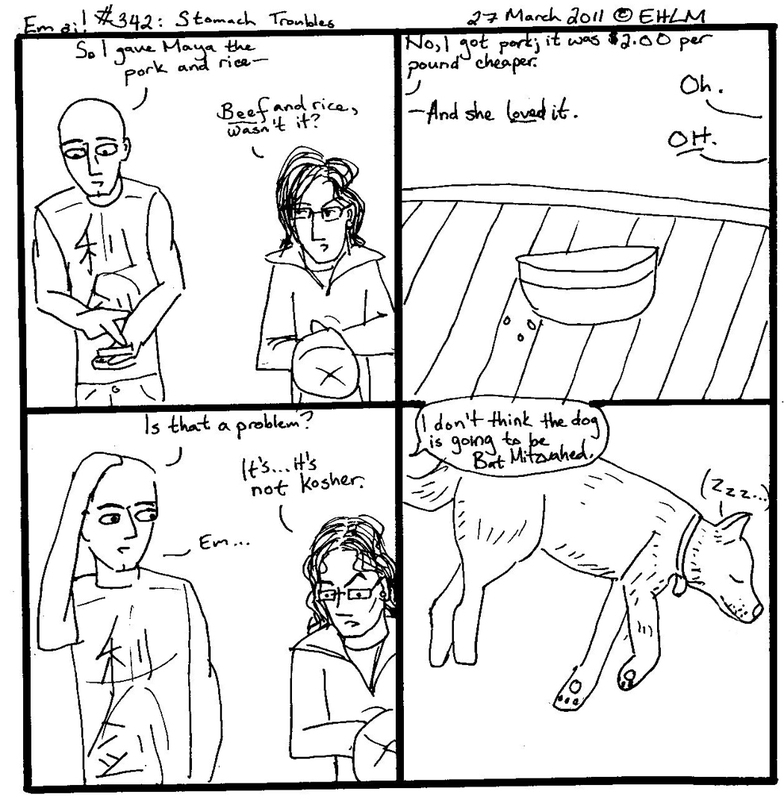 This comic is filed under SF427.4.L86 S76 2011 for Animal culture–Pets–Dogs–Feeding. Anyway, next comic will be better, I promise. And sooner. Last comic about the dog, I swear.